One of the UK's biggest electronics retailers has collapsed into administration after talks with buyers failed to secure a sale. 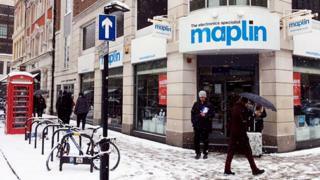 Maplin, which has more than 200 stores and 2,300 staff, will continue to trade through the process. The business faced the slump in the pound after the Brexit vote, weak consumer confidence and a withdrawal of credit insurance. These factors made it "impossible" to raise capital, boss Graham Harris said. The news came shortly after retailer Toys R Us went into administration. "We believe passionately that Maplin has a place on the High Street and that our trust, credibility and expertise meets a customer need that is not supported elsewhere," Mr Harris said. Maplin will now work with administrators PwC "to achieve the best possible outcome for all of our colleagues and stakeholders", Mr Harris added. PwC said it would "explore all opportunities to find a new owner". Stores will open as normal during this time, and there are no plans to close shops or make redundancies at the moment, PwC said. Any outstanding customer orders will be delivered, while gift cards will continue to be accepted in stores for the present, it added. Zelf Hussain, joint administrator and PwC partner, said: "The challenging conditions in the UK retail sector are well documented. "Like many other retailers, Maplin has been hit hard by a slowdown in consumer spending and more expensive imports as the pound has weakened," he said. "Staff have been paid their February wages and will continue to be paid for future work while the company is in administration." Maplin has 2,335 staff, 217 stores and an annual turnover of £235.8m. It operates in the UK and Ireland and has head offices in London and Rotherham. It began as a mail-order business in 1972, providing electronic components to hobbyists. Maplin opened its first shop in Westcliff-on-Sea in Essex in 1976. After changing hands several times, the chain has been owned by Rutland Partners since 2014. Potential buyers had included Edinburgh Woollen Mill, the clothing company that owns Peacocks, Country Casuals and several other retailers. However, talks are understood to have broken down. High Street chains have been badly affected by lower consumer spending, higher inflation and competition from online rivals.